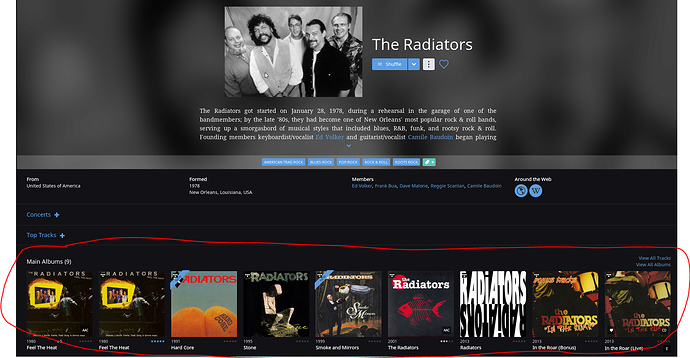 How can we get a metadata issue regarding The Radiators sorted out ? 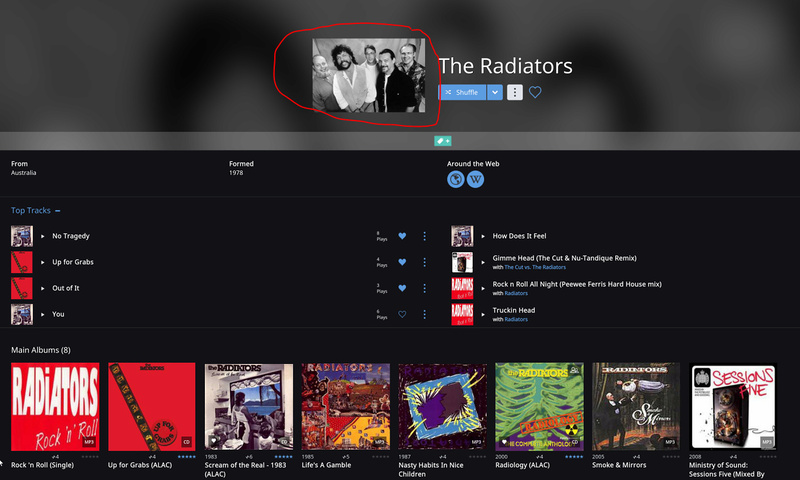 I am more interested in the Australia band, my albums of their are identified incorrectly in some cases. Would you like me to provide some examples ? Hi, @Jaap74, thanks for your report! Could you please provide some examples that you talked about in your post? @ivan ? Any news ? It’s now been 44 days since my request, can I get some feedback please ? Hey @Jaap74 – we have some ideas about what’s going on here, and we have some work in the pipeline that may help here. Unfortunately, it will almost certainly be a few more months before those changes go live, as they represent a pretty sweeping change to how our system handles artists and albums, and obviously there’s a lot of testing to be done before we flip the switch. Anyway, sorry for the slow feedback here. From what I’m seeing these artists are confused on TIDAL as well, but we’re reasonably confident we can do better here once the changes I mentioned above go live. Would you suggest I report this to Tidal or no point ? This metadata issue still hasn’t been fixed, can you advise if it will be ? Can somebody please confirm that my outstanding issue from June is being looked into ? Can somebody please reply to me ? Apologies for the continued difficulties here. The changes that Mike mentioned above have gone into effect and in many cases resolved issues like the one you’ve reported here. Since there still appears to be an issue with this artist it sounds like there may be incorrect data stemming from our metadata provider which requires some additional investigation. I am going to bring this issue to our senior technical team for further investigation and I’ll be sure to update you once I have more information here. Would you mind sharing one of these albums that are showing under the incorrect The Radiators with us? Ideally, you can zip up the entire folder and send me private message containing a shared dropbox link. If you don’t have Dropbox or need another way to send the media, just let me know. It’s now over 10 months since I logged this ticket, surely a record ? I just double checked my messages here, and I didn’t see that I received any messages from you. Would you be able to send along one of these albums so we can take a look? Thanks, @Jaap74! I’ll get this over to the team so they can take a look. Thanks for your patience here while we’ve looked into this. I just spoke with the team about this and wanted to follow up with their findings. This album that you’ve shared with us is unidentified because we do not have any information from this album from any of our metadata sources. 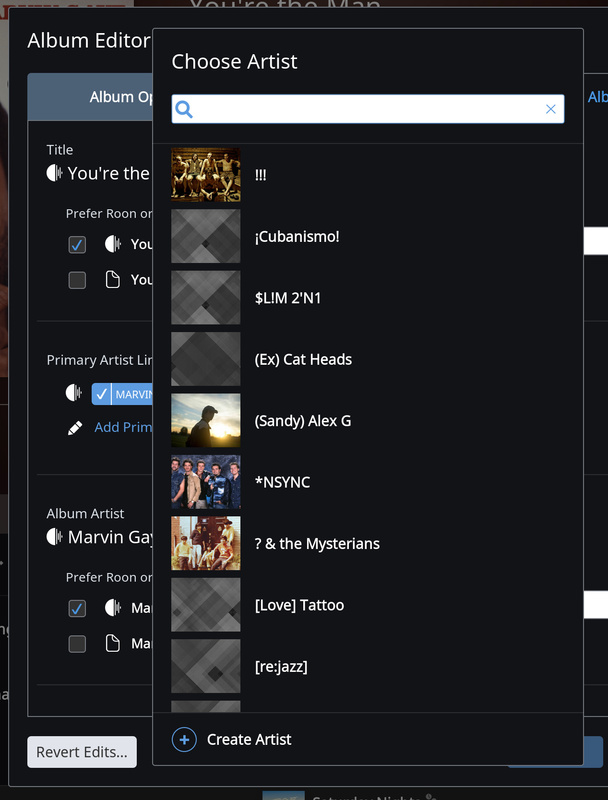 In cases like this, Roon has uses some logic that will search for artists that already exist in your library with that name and match accordingly. 99 times out of 100 this logic will place the album with the appropriate artist, but this is one of the rare cases where the album is placed with an artist it doesn’t actually belong to. We did some further investigating here, and, while out metadata index does know about this artist, it doesn’t appear that this artist has any albums available on TIDAL or Qobuz, which can sometimes be used to help in situations like this. The information that we have on this artist, including the albums associated with them, is very limited.